"Why winning people for Christ needs something better than a polished sales pitch." Based just on the number of people you can speak to and give the Gospel to, door to door is the most efficient (and cost-effective) thing there is -just from a numbers standpoint. If we believe the Holy Spirit must convict men in order for the Gospel to have any effect, then are we really just using "relationship building" as an excuse to not knock on doors and give literature to people, or share the Gospel with them? After all, the Holy Spirit can convict and call people to God any which way He wants, can't He? Who's to say He'll work through a "relationship building" approach better than a "door to door" approach? However, if we are intent on just giving the Gospel to as many people as possible (relationship building aside), then should we just buy billboard space, or radio and television ad time and plaster the Gospel out there any which way we can? Should we just send bulk postcards with the Gospel to every house and apartment in our city? After all, that's efficient too, isn't it? A relationship building approach is slow, but that is the way I do it. Am I cowardly? Did the Apostles do it that way? I visited the home of a young girl who goes to our AWANA Club last night. I'd never met the mother before. I'd sent her a letter and a tract a few weeks before. Last night, my wife and I brought her some banana bread and sat and chatted for about 30 minutes. We invited her to our Christmas service and left. I didn't share the Gospel with her. I thought about it, but I opted to wait for a later time. I didn't want to be pushy the first time we met. I've been thinking that maybe I'm really just a coward. These are the thoughts that constantly swirl around in my brain day by day. I'm not sure if I'll ever get a handle on it. The only time I see door to door anymore is when JW's come around. I think that door to door is promoted because it is traditional, visible, and 'easy' to do in terms of scheduling. I'm always looking for ways outside of the box to present the gospel. We've used the "Share the Good News" kits from Crossway, we've talked about giving new testaments at mass transit stations, there's a lot of relational stuff that goes on, etc. Right now I'm planning on giving one of MacArthur's books (God's Gift of Christmas) to someone that I will speak with today. Our church puts up a tent for the village/town celebration days and we have had success giving the gospel out that way as well. Every once in a great while, the church will organize and go help someone with a physical need for a work project or something like that - we built a shed for a man a couple years ago when a tree fell on his and wrecked it. That kind of thing. I guess what I am trying to do is get outside of the 'salesmanship' of the gospel presentation and into the 'good news' side - here's something that will whet their interest in us, our church, or our materials. I don't want to come across as a pushy salesman because there is already so much pushiness and salesmanship in pop culture that I feel we need to work against that deliberately. Fearing that we will lose God’s favor if we don’t present the full gospel in a rigid formula every time we speak with an unbeliever, we become pushy and mechanical and thus lose the joy and intimacy of the gospel. Especially the first clause... I think this is a problem with any canned presentation, we become so anxious about the presentation that we forget the person we are presenting to. I've tried to spend more time starting conversations when I do door to door evangelism. There will be time enough to present the gospel if the people we meet will open that door. I see our job at the door to be one where we try to meet people and start conversations if possible. It isn't always possible, some don't want to talk at all, have the barriers up. I try to pleasantly leave and move on. We've been in a Bible study for the last three weeks with a Muslim man from Egypt. I think he sees himself as a Muslim apologist and is trying to convince me of his views. I don't know how long I'll have the opportunity to speak with him. We met him by knocking on his door. So... basically, I am for door-knocking, because it is a good way to meet people. But we do need to think through what we are doing and not be worried about trying to argue someone into the kingdom. I don't like callers at my door. Our "day" home is Saturday. We don't even get going until after 10:00 a.m. (or later). But it is a legitimate means of contacting the public. 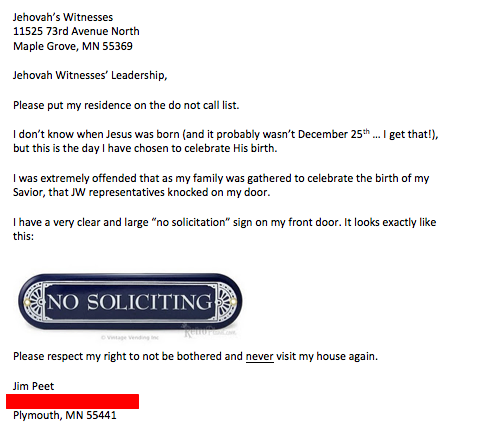 If someone posts a no soliciting sign, though, I don't knock. I think they have grounds to call the police on you for trespass if you do. I didn't share the Gospel with her. I thought about it, but I opted to wait for a later time. I didn't want to be pushy the first time we met. I've been thinking that maybe I'm really just a coward. There are plenty of scriptures that tell us to share our faith and not be ashamed of it, but I cannot find a verse that says that we have to share the gospel every time we meet someone. We had new neighbors who moved in about a year ago. Since they live next door we expected to see them again. We did not witness the first time we mte them. We invited them over for a meal after they moved in and tried to direct the conversation to spiritual things without a canned message. It did not go anywhere, but we did become friends. The friendship continued but each time I tried to talk about spiritual things it was like dropping a bowling ball in a snowbank. Then one night I was by the garage working on my truck when the neighbor came over with a beer in his hand. He said, "you don't drink do you?" I told him I did not and he went on to say he wasn't an alcoholic but was drinking more because of some problems he was having. I asked him if I could pray for him. He told me he wasn't into that and then went on to tell what had happened when he was a kid. His mom was trying to raise the kids by herself and a pastor had told her in front of the whole congregation that she was not giving enough money to the church. My neighbor was just a kid then and he had not wanted anything to do with Christianity since then. I told him there was no excuse for what that pastor had done, but I also told him that even though men will let us down, God will not and that we need to put our trust in Christ, not sinful pastors. I was then able to share the gospel in detail with him and I could tell he was listening to every word. He did not make a profession of faith right then, but I he was listening in a way that he would never have done if I had just shown up as his door to share the gospel. Further, if I had tried to force the issue earlier, I believe that this opportunity would have been missed. From the time we met these neighbors we kept praying for them and continue to pray for them now. After sharing the gospel that night he said that some day he might come to our Bible study, but that he just wasn't ready yet. He said this unprompted, so I believe God is working in his life. It often takes time. I witnessed to another friend for 20 years before someone else led him to the Lord. Today he is a changed man, not just someone with a profession. 1. I was an assistant coach for a neighboring towns public high school for 4 years. 3. My kids in sports, and other community things. The Lord has allowed us to meet many people. We usually have to add 30-40 min per visit to the grocery store. 4. I am also now a paid chaplain for a hospice. I am considered by many the "community pastor." This is a blessing and a cuse. I have the privilege of preaching many funerals where I give the Gospel. I had the privilege of preaching the funeral of a 15 yr old boy in March (over 800 present, most unsaved). I am called to plenty of hospital beds. The curse is that to this point, I don't get that many people in my church yet. But still far more than when we did door to door. I have also modeled this for my people. I have said from the pulpit many times for people to get involved in peoples lives for the purpose of the Gospel. I call it building redemptive relationships. All praise be to God. Whether we do door to door or not, we need to be involved in peoples lives. Most of the people I know see their homes as a a place where they can relax and be free from interruption. A stranger knocking on their door is an intrusion. Let's face it, when was the last time you were visited by a door-to-door salesman? The technique was abandoned for a reason. I grew up in a small town. During my first year of seminary I was introduced to door-to-door visitation and returned to my home church, ready to evangelize by going "house-to-house". My pastor indulged me and we started down a street. I knocked on the first door and before I could finish my opening sentence the man of the house spotted the pastor behind me. (These people had never darkened the door of our church.) "Hi, Pastor! Come on in and sit down!" We were there for an hour. The scene was repeated until I finally realized that this pastor had connected with people in this town in more meaningful ways. He'd linger in locaal coffee shops, be involved in community activities, volunteered at the hospital, and (the most productive of all) made friends with the local funeral home where he was laways available for families in need.